Few groups of flowers have known as many centuries of popularity as the Dianthus. Introduced from France in the early fourteenth century, by the late 1500s they were among the most popular of all flowering plants. Very much in vogue during the Middle Ages, rents were paid with them and royalty had their portraits painted with them. The seventeenth century saw the beginnings of much more deliberate dianthus breeding and in the next two centuries, hundreds of cultivars became commercially available. The breeding of Dianthus has, in Europe today, remained a serious passion. Dianthus have lent their charm to European cottage gardens since the Middle Ages. They bloom with pert five-petaled single flowers, like little eyes, which also come informally semi-double and voluptuously double. They have a delicious perfume, clove like in some cultivars, a light fresh jasmine scent in others. Radiantly bright, these flowers would be eye-catching even if they didn't lure you in by the nose first, their sweet floral scent is absolutely irresistible. This hardy perennial grows up to 30cm (12in) tall and as wide. The sturdy foliage forms a compact cushion of evergreen, grey-green foliage, which are decorative even when the plants are not flowering. It is perfect as an edging plant, or at the front-of-the-border, in the rock garden or for containers. The plants prefer a position in full sunshine with good soil drainage, but other than that is quite unfussy about conditions. It blooms for a long period between late spring and autumn and requires minimal aftercare, simply trim lightly after flowering to maintain a tight, compact mound and to encourage new growth. Bees and butterflies adore them and the petals of Dianthus are edible. Not terribly filling but they will prove to be the most magical of ingredients, turning a green salad into a flowery mead and a scoop of ice-cream into a fairy castle. Perfect for use as a cut flower for small romantic bouquets. In a small jug or vase, the flowers will pour forth their fragrance indoors for as long as a week. Dianthus chinensis var. heddewigii is one of the most exquisitely patterned of all the China Pinks. It is also one of the most fragrant. 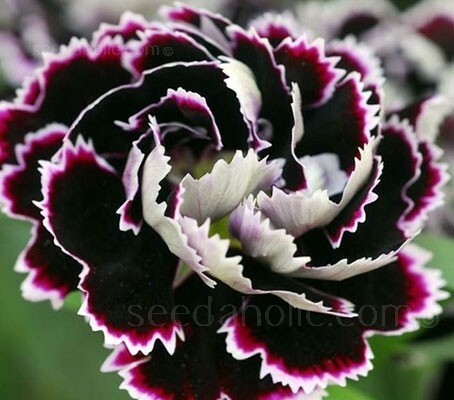 The fully double blooms are stacked several layers high, displaying the rich maroon, almost black petals with lacy white edges to full effect. An heirloom variety (listed in the Burpee Seed catalogue back in 1888), it is very free flowering and produces elegant, bushy, uniform plants 30 to 38cm (12 to 15in) tall with bluish-green foliage. Blooming the first year from seed, this short-lived perennial is also grown as an annual. The dainty, fully double blooms are heavily laced, over an inch in diameter. They bloom throughout summer and are sweetly scented. The aroma usually described as reminiscent of cloves but is a definite sweet and spicy mix, perhaps a touch of allspice with a hint of nutmeg. Position these plants where you can sample the fragrance and admire their beauty up close. Containers of all kinds are perfect, but it also makes a big impression as edging or near to garden paths. Sowing: Sow February to June or September to October. Sow seed on the surface of a good, free-draining, damp seed or multipurpose compost. Do not cover the seeds as light aids germination, but tightly press into the compost. Place the container in a propagator or seal inside a polythene bag and place at 16 to 20°C (60 to 68°F). Germination usually takes 14 to 30 days. Keep in cooler conditions after germination occurs. Transplant to 9cm (3in) pots to grow on and transplant outdoors once the plant is established. Overwinter September sowings in a coldframe and plant out the following spring. Most dianthus species and cultivars require full sun for their best flowering. They do best in neutral to alkaline soil that drains well. Dianthus do not tolerate wet soil well, particularly in winter so don't plant them in a low spot where water collects and keep mulch away from the plants. Overwatering and heavy clay soils are the kiss of death, quickly killing the plants from stem rot. Mix in plenty of well-rotted organic matter when planting and apply a balanced liquid fertiliser once a month throughout spring and summer. Pinching out faded blooms with finger and thumb will encourage a second flush of flowers. Shear back the mounding ones to encourage repeated blooming. Harvest Dianthus flowers when they are almost fully open - not in bud. Picking when the buds are too tight may result in the perfume not developing fully. Snap the stem at a node (joint) close to the base of the plant. If the stems are tough it is preferable to cut the flowers with scissors or a knife to avoid damaging the plant and thereby reducing the risk of disease entering wounds caused by careless picking. Ensure the plants are regularly fed throughout the flowering season using a rose or tomato 1:1:2 fertiliser. Watering is preferable at ground level rather than overhead which may damage the blooms. Some varieties may take a six-week rest after the first flush of flower but after feeding and watering they will start again. This way you should be able to have a continuous harvest of blooms for cutting from the end of April until the end of September. The petals of Dianthus are edible. Not terribly filling but they will prove to be the most magical of ingredients, turning a green salad into a flowery mead and a scoop of ice-cream into a fairy castle. Dianthus flowers have a pleasant spicy, floral, clove-like taste, especially the more fragrant varieties, and are ideal for decorating or adding to cakes. They make a colourful garnish to soups, salads and the punch bowl. The petals add zest to ice cream, sorbets, salads, fruit salad, dessert sauces, seafood and stir-fries, and can also be used as a flavouring for sugar, oils and vinegars. Pick young flowers and buds on dry mornings, before the sun becomes too strong, so the colour and flavours will be intense. As on many flowers, it is advisable to remove the white heel at the base of the petal as this has a bitter taste. Cottage/Informal/Natural Garden, Borders and Beds, Dry Gardens and Rockeries. Dianthus chinensis, most commonly known as the China pink is a species of Dianthus native to northern China. The plant has a large distribution area in East Asia, which includes not only China, but also Korea and eastern Russia, to the northwest it still occurs in Mongolia and Kazakhstan. The Flora of China also counts Europe as the area of distribution. The sites include grasslands as well as sparse forests. This species was introduced from China in 1716 and has been cultivated in Europe and America since the early 18th century. The first American reference to China Pinks occurred in Boston in 1760. Unlike its cousins, carnations and grass pinks, this species is not fragrant. A wide variety of habitats including sandy forest margins, dry hillsides and summits, forest and hillside grasslands, scrub on mountain slopes, rocky ravines, meadows and streamsides. Dianthus were probably introduced to Britain in the early fourteenth century from France. The easy hybridisation of this species led to numerous varieties. In the Middle Ages, rents were paid with them, and royalty had their portraits painted with them. By the late 1500s, they were among the most popular flowering plants for containers, as they are in Europe today. The seventeenth century saw the beginnings of much deliberate dianthus breeding in England; in the next two centuries, hundreds of cultivars became commercially available, including the feathered or ‘starre’ pinks, with very frilly petals and a pink eye; the ‘pheasant’s eye’ pinks, with a dark central blotch and a soft band of colour along the jagged petal margins; and the ‘laced’ pinks, fully double flowers with strong colour at the margin and base of each petal. The breeding of dianthus remained far more serious a passion in England. In Britain, regional societies of amateur and professional plant breeders vied with one another to produce pinks that conformed to show standards as stringent as those the rose societies levy on hybrid teas today. By the 1850s, the British considered pinks a national flower with many sentimental associations. In the Victorian language of flowers, pinks speak of pure affection. Dianthus travelled to North America with the English colonists, where breeding became the rage in the United States during the nineteenth and early twentieth centuries. The genus is now thought to embrace some 300 species and innumerable hybrids and selections. Dianthus was named by Greek botanist, Theophrastus. He named them from the Greek dios meaning ‘divine’ and anthos ‘flower’, meaning ‘God’s flower’. The specific epithet chinensis means 'of or from China.' referring to the origin of the plant. It has the synonym Dianthus sinensis, this alternative species name also means 'of or from China'. Sinensis derives from the Latin sinae, the Greek sinai and ultimately the Arabic san, the kingdom of China. The variant name 'Heddewigii' is a group of compact, free flowering cultivars derived from this species. The most popular colour of 'Black & White' is also marketed under similar names such as 'Velvet and Lace', (Velvet 'n' Lace) and 'Minstrels'. They are commonly referred to as the China pinks, sometimes Japanese pinks or even Rainbow pinks, in reference to the multiple colours. Many Dianthus are called 'pinks.' Not due to their colour which can also be white, but to the distinct cut edge that the flowers have. The verb 'pink' dates from the 14th century and means 'to decorate with a perforated or punched pattern' (maybe from German 'picken' = to peck), coming from the frilled edge of the flowers. This verb sense is also used in the name of pinking shears. Interestingly, the colour pink may be named after the dianthus flower. The word ‘carnation’ is derived from the Latin word coronae, meaning 'coronations'. Coronations were decorative, woven flower strings worn on the head like a headband that are often pictured as being worn by young maidens. The genus Dianthus consists of over 300 species, including the well-known Carnations and Sweet Williams, several hundred named cultivars and innumerable hybrids. D. barbatus, known as Sweet William, this is a biennial plant that sometimes behaves as a short lived perennial. At 45 to 60cm (18 to 24in) tall, it blooms in a wide range of fragrant coloured blossoms and as such has been a garden favourite for over 300 years. D. caryophyllus, the ancestor of most of the modern garden carnations. When you see a perennial carnation in your local garden centre, it is most often from this species. D. chinensis are the China Pinks. Varieties are often sold in garden centers as perennials although many are not reliably hardy in cold areas. They can be treated as hardy annuals unless you live in a warm zone. D. deltoides is a common plant in garden centers because of the ease of starting it from seed. Use it at the front of the border or in gravel or rock gardens. D. grataniapolitensis or Cheddar Pink grows to 30cm (12in) and is a delightfully fragrant soft pink colour. D. knappii is called the Yellow Pink. At 60cm (24in) tall with soft yellow flowers that bloom for several long weeks, it is worth a place in any garden. D. plumarius is the plant most often referred to as a 'Pink' and is a good performing plant. They are shorter than many types of Dianthus so plant them in rock garden sites or protected from aggressive plants in the border. Also marketed as 'Velvet and Lace', (Velvet 'n' Lace) and 'Minstrels'. A wide range of soils provided they are well drained. February to June or September to October. 14 to 30 days at 16 to 20°C (60 to 68°F).